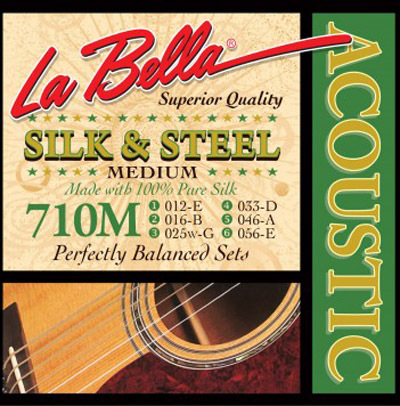 Finger-style guitarists favor La Bella's Silk & Steel strings for their soft touch and sweet tone. The medium tension 710M set is made with silver-plated copper wire, hand wound over a middle layer of pure Italian silk filament and a steel core. These strings have less tension than standard strings wound with steel, bronze, or brass. La Bella makes the strings in the USA with American wire. Q: What is the total set tension in lbs. ? A: I am sorry but we do not have that information at this time. We are hoping to be able to provide the tensions for all the set that we sell in the near future.